Large carnation type blooms borne on tall vigorous plants make this variety ideal for background plantings as well as for cutting. The 3-4 inch yellow blossoms are well rounded and fluffy, and have a sweet fragrance. Pick flowers frequently to encourage denser growth and more blooms. 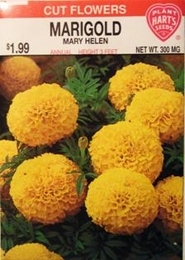 Marigold Mary Helen prefers full sun. Thinning - when plants are 3-5 inches tall thin to 12-24 inches apart.